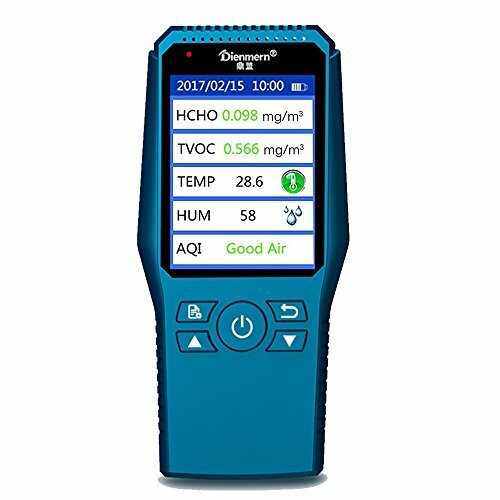 Umootek Multifunction Air Quality Monitor is easy to operate, we keep the most important and essential parts for a good air quality monitor - high accurate for testing! We adopting electrochemical formaldehyde sensor, PM2.5 laser sensor, TVOC sensor, air quality sensor, with our smart chip, digital signal amplification for more accurate data. It can be widely used in household, office, car and many other environments. Know What's in the Air You Breathe - Umootek 4-in-1 multifunctional air quality detector, Formaldehyde Monitor with PM2.5 and TVOC(including benzene) Test with stand, real time air quality record and analysis, smart time display. Large LCD Color Screen with English operation system easy to read the testing result, more convenient to use for indoor air detect. Latest Anti-interference Technology, adopting 12 bit AD smart chip with digital detection signal amplification, hardware and software arithmetic, more precise reading. Convenient to carry around, perfect for the environments, such as house, car and office , etc..
Test item: HCHO, TVOC, PM2.5. 1 x Power adapter with USB Cable. - Please read the user manual before use, or send us message for immediately assistance. - It should do calibration before detection and read the testing results after 5 minutes detection. 【Multi-function】:This product is upgraded intelligent air detector combing with the multifunction of formaldehyde, TVOC, Temperature, Humidity, AQI, air quality record chart. This upgraded air quality detector has more options and functions to inform you about air quality and protect your family's health. 【ADVANCED SENSOR】:It's designed with advanced Sensor technology, electrochemistry HCHO sensor and TVOC semiconductor sensor to detect the formaldehyde, TVOC, temperature and humidity accurately. 【RAPID DETECTION WITHOUT CALIBRATE】: Don't need to calibrate, you can detect the air quality directly in Real-Time. It means you can monitor air quality anytime easily. 【EASY TO OPERATE】Easy to use with simple system settings through 3 function buttons.Large LCD screen intelligently display the testing results. Affordable and portable to monitor air quality, micro USB and power adapter for charging! 【WIDE RANGE OF APPLICATION】:Suitable to use at home, office, in the car ,outdoor and so on. Test the Air Quality anytime anywhere to be away from harmful of PM2.5,HCHO, Haze and So On.